A machine-vision based system for detecting cracks in nuclear reactors could help improve safety, while saving time and reducing the need for tedious and difficult work, according to civil engineers at Purdue University in Indiana, US. The technique is claimed to be more reliable than other automated inspection techniques and able to distinguish between cracks and harmless artefacts in the surface texture of the reactor casing. Inspection of nuclear infrastructure is vital to ensure its continued safe operation, and is particularly crucial because exposure to radioactivity can render metals more brittle as well as causing them to swell. Mohammed Jahanshahi, who led the Purdue research, points out that leaks at US nuclear reactors in 1996 and 2010, caused by cracks in valves and underground pipes, cost a total of almost $1bn to repair. Currently, crack detection is done by power station staff studying video footage from inspection cameras. Human intervention is necessary because, until now, automated systems have been unable to distinguish between a crack and a scratch, weld or grind mark, as cracks tend to be small and the contrast on the videos is not high. The system accurately distinguishes between cracks and other features, outlined in red boxes. Jahanshahi and colleagues have developed a system that uses both single frames from inspection videos and multiple adjacent frames, using a logic technique known as Bayesian data fusion. “Moreover, we can filter out falsely-detected cracks and increase the reliability and robustness of crack detection by using Bayesian decision theory,” he added: this feature assigns a confidence level to a detected crack and indicates this on the inspection video by highlighting the crack image in a coloured box; a high confidence crack will appear in a red box. 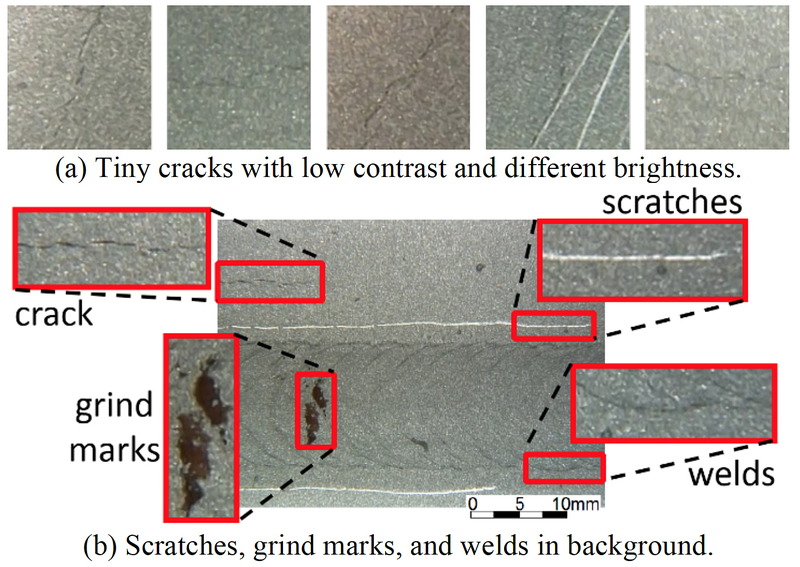 The team tested the technique using video footage of underwater metal components in similar conditions to those found in nuclear reactors, featuring a mixture of cracks, welds, scratches and grind marks. They describe their work in a paper in the journal Computer-Aided Civil and Infrastructure Engineering. Jahanshahi is now working on improving the technique. “We are currently working on the second version of the software by developing deep learning algorithms to detect cracks for this application where we have significantly improved the performance of the system using Constitutional Neural Networks,” he said. Fascinating stuff: presumably applicable to other ‘surface imperfections’ such as coating, printing, textile production, food, painting?